The Toplight Line Senso, offers LineTec lens technology & Senso function. LineTec enables other traffic participants to better estimate the distance to the bicycle. 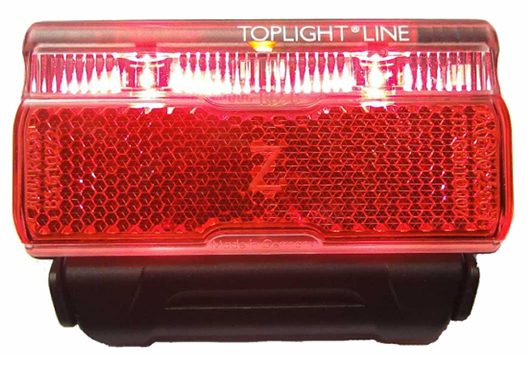 The Toplight Line Senso offers a 320 degree visibility due to its special lens system. The Senso function activates the light and motion sensors in the taillight. When the bike is moving and it’s dark, the light is automatically switched “On”. When you stop, the light stays on for a few minutes, and as long as you don’t move again, it switches off and stays off. The 50mm mounting studs integrate well with Tubus and Racktime racks. It’s extremely light and flat, battery powered.